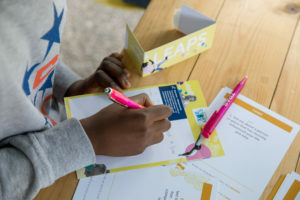 Last Saturday, on a council estate due for demolition on the edge of North London, we trained local community leaders to run Storybox sessions. 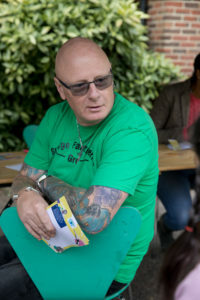 It was prompted by urgent challenges around community cohesion on the estate. These have come about due to the delay in the redevelopment of the council estate. A high turnover in tenants and a slow response to economic and social issues have also added to this. That said, there is a committed and determined resident steering group (shortly to form a resident association) who are trying to tackle this head-on. And with that we explored the idea of testing Storybox as part of the association’s annual flagship community celebration. Because sharing stories is one of the best ways of bringing people together. How do you feel like an activity like this can benefit communities? When you meet people you tend build up ideas about them. You think you might not have anything in common with them. This makes you talk, it makes you share stories. You will pick up on things in those stories you can relate to. And that’s what starts up conversations and forms a bond with people. I was speaking to a gentleman here who is 72. I thought I would have nothing in common with him. And I thought I perhaps wouldn’t have much interest in his story, but he has lived a most fascinating life. And from what I could tell from his body language, he was interested in my story too. If this is replicated around our cities, I think it has the possibility to catalyse relationships within communities. It was thought provoking. It was quick. It made people think about what is important. And what they wanted to commununicate. It was quite emotional. It was interesting that everybody spoke about something that is actually very personal. Which in the world we live in, everything is so superficial. You think people just want you to know what they see. But actually that shows that they didn’t. They wanted to share something about who they actually are. I think the most meaningful thing was that everybody wants to give back something. I could do it. It is really easy. Older people would benefit from it, it would be good to run as an intergenerational thing. No matter how old or young you were there was something significant. It is easy to facilitate yet it is very meaningful. I walked away with loads. It connects you with people in your community. I could really see it working in lots of different environments. We wanted to test if the format we’ve spent a year developing might also work in a setting like this. And the opportunity to try it out in practice came about from a catch-up with Raj Kumar from One Enterprise Ltd. Raj draws on his 30+ years of experience in the housing sector to advise a range of tenant associations. This one is particularly close to his heart. We’re glad we did it. It worked a treat and we really want to work with more communities to try out this approach. If you’re interested in learning more – or running one of your own, get in touch.